The KABK’s Metal Workshop offers students the opportunity to discover all forms of metalworking using professional equipment and tools, including sheet metal (cutting, bending, rolling, plasma cutting), construction (cutting and bending profiles), machining techniques (drilling, milling, turning) and welding (MIG/MAG, TIG, autogenous welding). 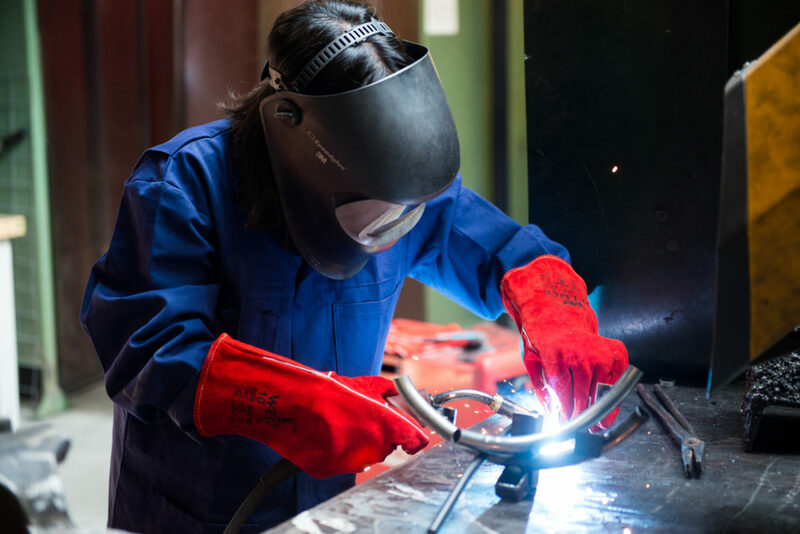 The Metal Workshop staff is eager and willing to help students learn the craft as well as guide them in their experimentation with the equipment and tools provided. Work with hand tools such as angle grinders, nibblers, hammers, files, taps, cutting plates, soldering irons, and the necessary measuring and marking tools. We have a smoke extraction unit for welding, soldering and grinding; a special cutting/downdraft table for plasma cutting; and a mobile extraction unit in case the fixed extraction unit is not sufficient. Explore our laser cutter or experiment with jewellery, enamel or casting in sand. Attend an introductory training course or opt for an additional training course in welding. You will be required to inform the workshop supervisor on duty about your plans, and they’ll be available to assist you if needed. Proper preparation pays off; make sure you have a plan that includes a drawing/sketch of what you intend to make and a list of materials you will need. We will provide personal protective gear, such as safety shoes in a variety of sizes, safety goggles, hearing protection, welding gloves, welding goggles and welding masks.